A few years back I had the opportunity to work on two consecutive cookbook campaigns for Emeril Lagasse, which connected me to him and his cooking style. The obvious next step for me was to visit one of his restaurants, while in New Orleans. 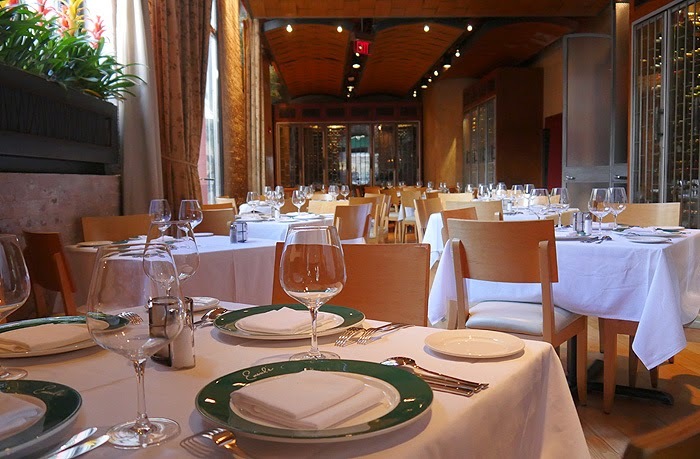 I made my way to Emerils, Lagasse's flagship restaurant, located in what is known as the warehouse district of New Orleans. The restaurant's interior features rustic exposed brick and glass walls, a wine wall made with plaster-lathe wood and a Chef's Food Bar where guests can watch the kitchen action while enjoying a meal. Led by Chef de Cuisine, David Slater and overseen by Chef Lagasse the restaurant's cuisine pushes culinary boundaries with its bold and diverse flavors. Having spent his childhood in Toronto, a multicultural city, Slater developed a diverse palate at an early age. 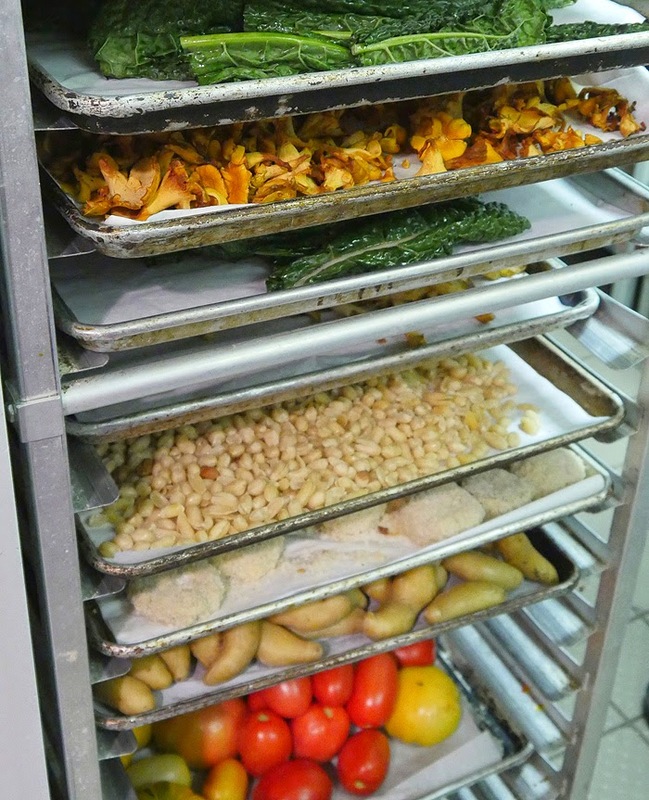 This and his passion for local ingredients are what inspires his cooking at Emerils. Chef Slater was there to greet me upon arrival and graciously led me through the kitchen pointing out all of the stations and explaining the work flow of each. 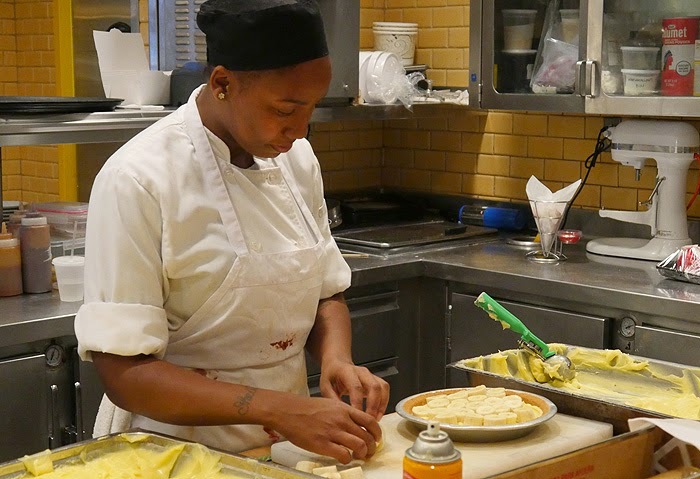 It was exciting to see behind the scenes of a real working restaurant kitchen. There was prep being done for that evening's dinner service, pots of greens simmering away and Emerils' famous banana cream pies being made. We ended our tour at the Food Bar where I got to watch as Chef Slater prepared some of his specialties for me to try. 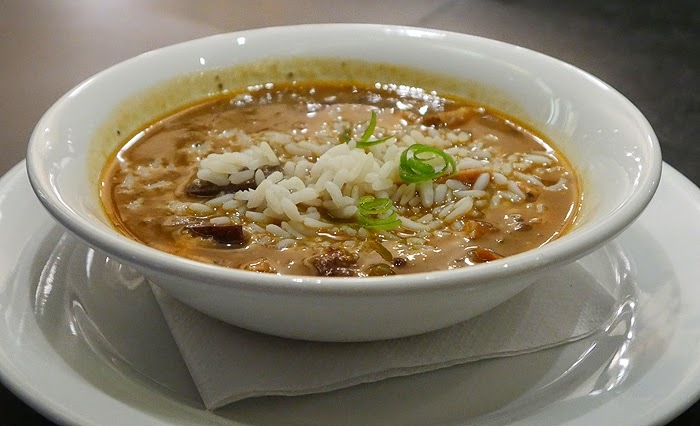 Up first was a steaming bowl of chicken and chorizo gumbo, a traditional soup with a nice spicy flavor. 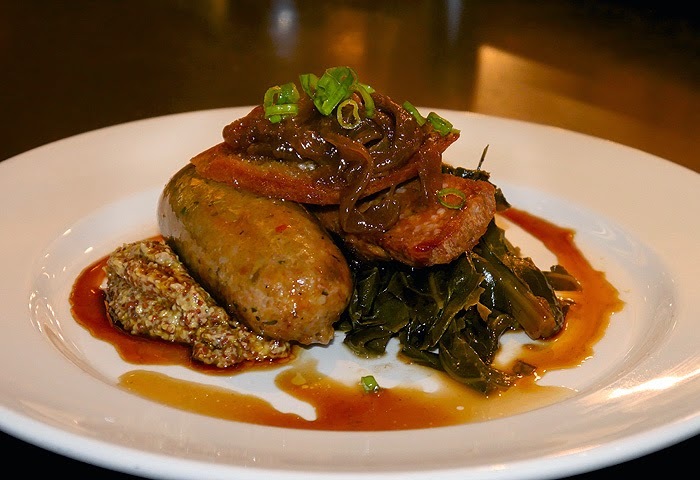 Next I sampled Chef Slater's house made andouille and boudin sausage served with delicious braised collard grains and spicy mustard. 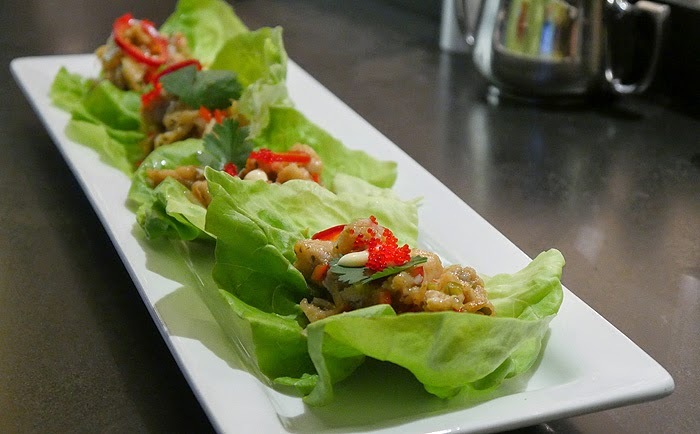 My favorite though were the fresh fish tacos, made with crispy pieces of escabeche seasoned with lime, orange and cilantro wrapped in butter leaf lettuce. I easily could've sat there eating and chatting with Chef Slater for hours but as things go I had to get back to my hotel and on to my next adventure. Thank you to Chef Slater and the team behind Emerils for welcoming me into the restaurant, and serving me some delicious food. That's somewhere I'd love to go! Everything you just posted looks so delicious. I would love a bowl of that chicken and chorizo gumbo. Looks out of this world. 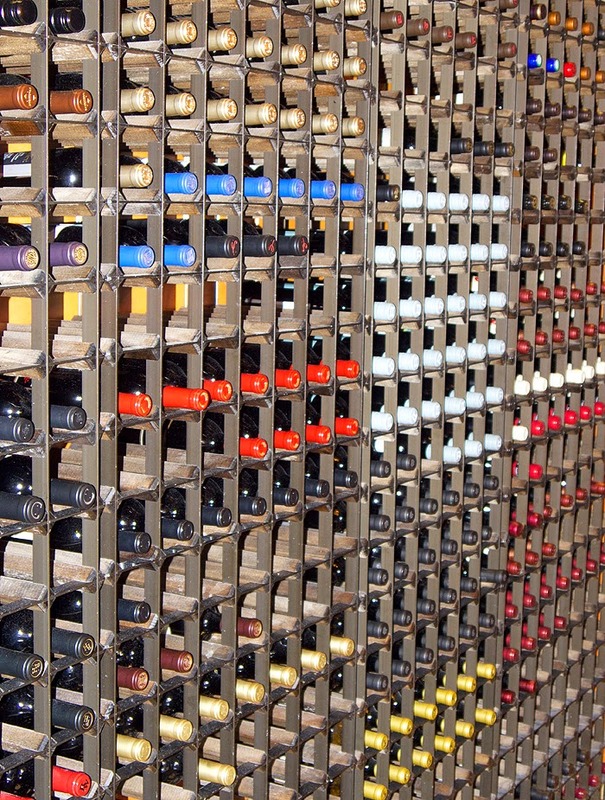 And that wine wall..can I get one in my house? How lucky you are to have such a wonderful experience! I'm sure you learned a ton and tasted some fabulous food! What an exciting adventure. I'm with Michelle.....wine wall...yes please! How fun. Look at all that amazing food. I would have been in heaven. I've visited a couple of Emeril's restaurants, and I've never been disappointed. Never been to new Orleans though... but this will be my stop when I get there!! How fun to get a sneak peek behind the scenes! Jealous! Oh wow, I am so jealous :) I'm glad you had this experience, it ones like that that nobody ever forgets! This was a fantastic opportunity for you. I am so happy for you. I bet you learned so much from all of it.